[DJ Sures] just can’t help himself from tinkering with robot toys built in the 80s. This time, he got his hands on an Omnibot-2000 (not to be confused with his other Omnibot hack), and updated it for the 21st century. After its obligatory run through the dishwasher, the robot was fitted with two heavy duty servos in each arm – one for the shoulder and one at the elbow joint. He added another pair of servos and a head-mounted camera to the robot as well, giving it the ability to look around and navigate through his house. While these physical modifications are nothing new to [DJ Sures], he wanted the robot’s control scheme to be different than what he has done in the past. Along with the standard autonomous/joystick/Wiimote/voice/iPhone controls that he built into his other projects, he added “visual glyph” control capabilities to the Omnibot. This means that the robot can recognize specific objects and surroundings, giving it the ability to perform context-related tasks. He’s working on getting the robot to recognize both the refrigerator and living room, in hopes of eventually having the Omnibot to fetch him drinks from the kitchen – that’s something we can totally get behind! 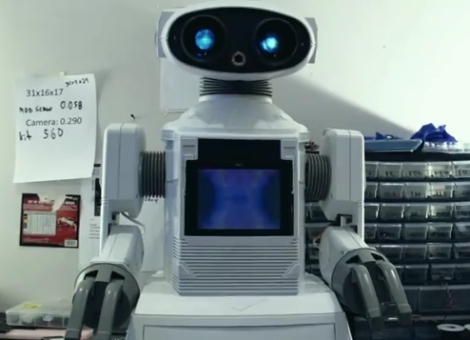 Continue reading to see a pair of videos of the Omnibot-2000 in action, and be sure to visit his site if you’re interested in seeing more. Very nice, the Omnibot seems to be the perfect base for this, unlike many of the store bought plastic robots, this one actually has room inside to stuff lots of upgraded electronics. I’m not really into robotics, but this may push me to give it a shot, assuming I can find one of these (Omnibot) in decent enough condition. Umm. How did I miss the part about it going through the dishwasher? I don’t see that anywhere, and I don’t understand the purpose of either stating that or mentioning it if it isn’t in the linked article. Nevermind. Saw it in the first 5 seconds of the first video. I missed that about 3 times. Wow. Back on topic, this is really amazing. This is what I dreamed of when I got toy robots back in my childhood (which happened to be in the 80’s). …terrible build video. I feel like I got ADD just from watching it. And what was that in the middle, were you making Couscous? I assume it was some moldable heat-and-shape polyester beads or something, but with no description it’s hard to tell. Saw it on Sparkfun a couple weeks ago. Your aunt Robin had the same robot, back in the days when she was a canadian childstar. 2-level deep reference, superior job! What do the letters EZ stand for? It’s amusing to watch him take it apart on a rug! I’m always afraid of losing little parts! Robot must be able to serve growlers not cans, real beer can’t come in cans. Could be a software bug or maybe just need to swap the wires that drive the head moter up and down.